Employaid is an online community for employees, employers, and small business owners to find the resources they need for career success. The economy, increasing corporate layoffs, workplace issues, and what seems to be more job stress than ever before, created the need for Employaid. We are Your Lifeline at Work. If you are an employee, Employaid will help you with instantly useful tools, strategies and skills to navigate the rough waters of your workplace. Or, simply to get ahead in your life, work, and career. If you are an employer, Employaid can supplement your existing HR/Workforce Issues Department, or be your full outsourced provider. The site also offers employers solutions for rapid on-boarding of new employees. 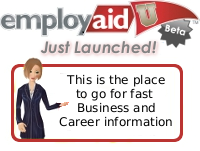 Contact us today to learn more about Employaid’s fast and easy co-branding opportunities. If you are a small business owner, Employaid is there as your outsourced, co-branded HR/Workforce Issues resource, or you can offer discounted memberships in Employaid to your employees. Contact us today to find out more. Because there is only one YOU, we’ve designed Employaid with you in mind. You can find the aid you are looking for across a wide variety of media - so you get what you want, how you want it, when you need it. Join our unique and growing community of Members who are changing the face of today’s workplace.